Academically, I have written about the myth of climatic and natural determinism, and the mistaken idea that nature determines the fates of societies, that nature dictates the shape of nations, as it was fashionable to think in the 18th Century and beyond. I have analysed this idea to pieces, in all sorts of ways, and on all sorts of topics, showing how this idea continues to shape politics in perverse ways. And yet, and yet, when Spring comes, and the sun shines, and trees start growing green, I feel totally determined by climate, totally and totally determined by what the weather and seasons are doing! Even the guinea pigs are enjoying the fresh air on the balcony today. I’ve been on a roll for the past few evenings, and so when the children are blessedly in bed, the machine is buzzing. 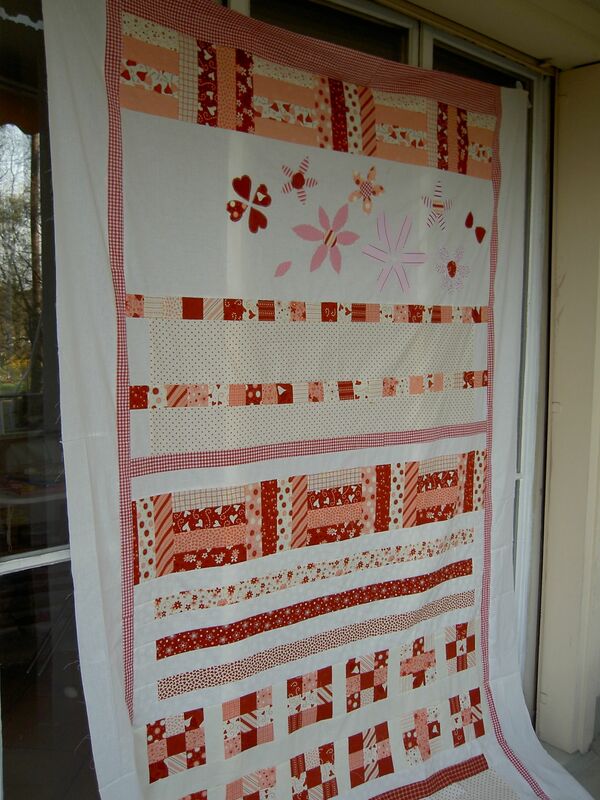 I finished an improvised quilt top in a few evenings, using up a jelly roll and scraps (mostly bits of children’s clothing) to make a terribly pink quilt. I don’t like pink, but one small member of the family does, and so it is growing on me… Now I need the ordered batting to appear in the post to finish it up. Super Swiss German shop sends these over efficiently, yipee. As I was sewing, I listened to a radio programme of those wonderful quilters – Amanda Jean and Cheryl Arkison – who offer such kind inspiration. One click, and they appear in the sitting room on the other side of the world. It never ceases to baffle me how technology can be kind to us sometimes. Then I threw this together with 2 charm packs and some cotton reclaimed from a duvet cover. 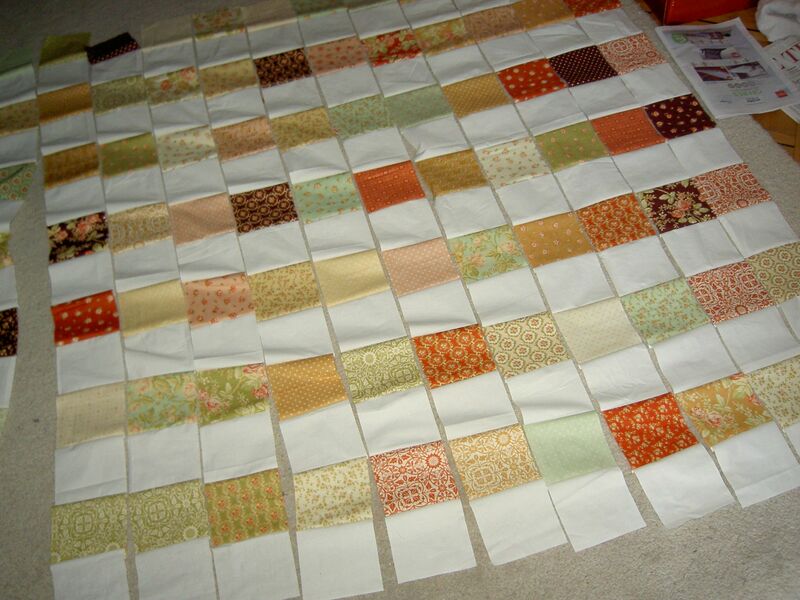 A bit of a cheat, but I hope to make a quick quilt for my lovely cousin and her little daugher who I will see over Easter in the UK. A beach holiday, hurray!